Do you have a PHP script you'd like to use, but can't get it installed? 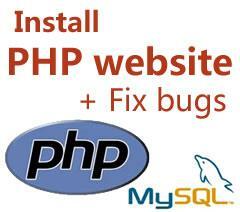 We will install any PHP script on your web server and fix small bugs/errors for you. No hidden charges or conditions. ANY PHP script on ANY Linux server. PHP is a programming language that allows web developers to create dynamic content that interacts with databases. To function correctly, a PHP script must be installed properly. We will install any PHP script, including those for shopping carts, blogs, forums, auction websites, chat scripts, classified Ads content management, customer support, user management, search engines, link exchanges, etc. temporary accounts, usernames and passwords of your FTP & Control Panel for us to install your scripts. Your privacy and file security is guaranteed! Your PHP script will be installed within 1-2 working days or IT'S FREE! We do not want your website or its contents to be at risk. We will need certain access to your website to install your script, but please feel free to create temporary accounts, usernames and passwords for me to install your script, then delete or disable them once we are finished. WE GUARANTEE THE SECURITY AND PRIVACY OF YOUR FILES ASSOCIATED WITH THE PERMISSIONS GRANTED TO MYSELF FOR THE DURATION OF MY SERVICES. If you have an urgent need to have your script installed right away, contact us via ask seller a question. In most cases during business hours, we can arrange for your script to be installed within 2-4 hours. We can also customize your script by modifying the functionality, layout, colors, etc. to tailor more to your specific needs. This service is also offered at an additional charge, based on the extent and complexity of your request. For more information on script customization, please ask us a question. If your script is not installed and configured by the end of the next business day, it's free! Average wait time for PHP script installation is 2-6 hours. We are a team of highly qualified web designers and web programmers. In the last 5+ years we offered our clients the best web services. Some of them are complex object oriented web programming, content management systems, forums, shopping carts, e-commerce, great web design creating, browsers compatibility, SEO and more. We use international coding standards (XHTML, PHP coding standard and more) and deliver nice and clean code that is well documented and easy for future modifications and improvements. We do quality testing and we use CVS for managing our projects. Most of our clients are UK based. We also have clients from Ireland, USA, China, Australia, Germany and other countries as well. Contact us now and join our happy clients list.